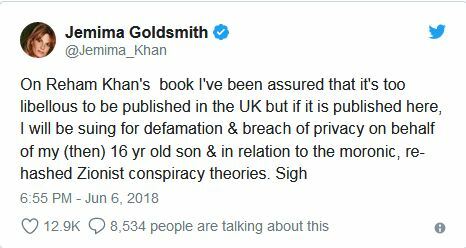 LONDON (92 News) – Jemima Goldsmith, former wife of Imran Khan, has said that she will sue on n behalf of her 16-year-old son if Reham Khan’s book is published in the United Kingdom. She wrote on Twitter that she had been assured that Reham’s book was ‘too libellous to be published in the UK’. “But if it is published here, I will be suing for defamation and breach of privacy on behalf of my (then) 16-year-old son and in relation to the moronic, re-hashed Zionist conspiracy theories,” she said. Reham’s autobiography, that is yet to be published, became a source of controversy last week after actor Hamza Ali Abbasi claimed to have read a manuscript of the book and accused her of being on a ‘PML-N agenda’. The accusation was followed by a Twitter spat between Reham and Hamza, in which the former alleged that the latter had been threatening her since last year. 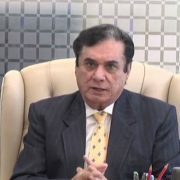 It has caused a furore among the PTI ranks, with Abbasi releasing screenshots of emails and issuing a statement last week to claim it has ‘documentary evidence’ that the author was in contact with PML-N leader Ahsan Iqbal and the book was being published to damage the PTI.